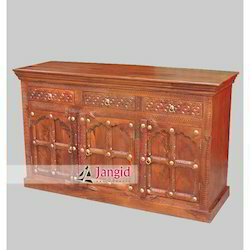 Our proficiency enables us to provide vast range of relevant products including Indian Wooden Living Room Sideboard. Offered product is delivered at the end of client within prescribed time frame. Keeping in mind the ever-evolving needs of our clients, we are devoted towards offering an optimum quality array of Industrial Vintage Sideboard. We have gained a huge appreciation in the market by offering an excellent array of Two Door Sideboard. Description : Side Board with 3 Drawers each side of Central Iron Mesh Door CupBoard. Size: 60" x 24" x 35"